The uncompromising handbook to revised living. Outspoken, combative and unconventional, it fuses philosophy, contemporary research and often compelling clinical experience in one explosive guide. The truth is something that burns. It burns off dead wood. Happiness is a pointless goal. For Jordan B. Peterson, influential clinical psychologist and professor of psychology at the University of Toronto, our true aim should be meaning – not for its own sake, but as a defence against the suffering that is intrinsic to our existence. 12 Rules for Life is a manifesto of personal change, a handbook to rewire our kneejerk beliefs and concepts of reward and truth. 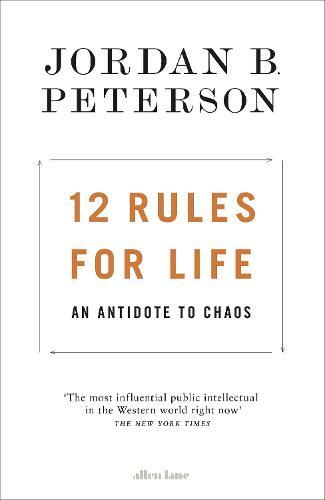 At its heart, this is a polemic of personal responsibility, twelve rules that form the scaffolding of profound growth. Each rule is accompanied by vivid and often footnoted example, setting his thinking in context; the sum is a comprehensive, sometimes almost brutal, assault on everyday assumption. Not without his critics, the often-outspoken Peterson rails against the world, from our inability to tell the absolute truth to our innate need to embrace high risk. Declaring himself a “classic British liberal”, the author eschews conventional political or social convention to deliver a self-help guide like virtually no other, founded on a dynamic personal philosophy drawn from both academia and experience. Jordan B. Peterson originally rose to prominence via his rather more academic Maps of Meaning and is now seen as an influential figure on a number of internet platforms, not least his own YouTube series of lectures. The first time I heard of Jordan Peterson was via Sam Harris’s excellent podcast series. Unfortunately the two weren’t able to get to anything meaty, having failed to agree on the definition of truth for 2+ hours.